EdwardianPromenade: A Substitute For A Spouse? A Substitute For A Spouse? When I told my husband about the Teasmade, he asked: "Is that a subsitute for a spouse?" Surprisingly he hadn't heard of it even though he's English. 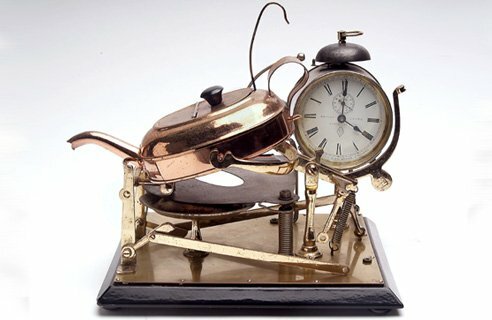 This handy invention which wakes one up with an alarm and the sound of hot water bubbling away was invented in Edwardian times. The first ones were heated by methylated spirits which set off the automatic striking of a match. Many fires were triggered by these, apparently. The first patent for an automatic teamaking machine was granted to Samuel Rowbottom in 1892. He was an electrical engineer who helped invent the first armed tank with Fred Simms. In 1902 the first commercial tea-making machines were made. 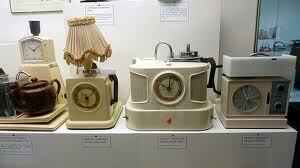 They featured alarms clocks and kettles which tipped hot water into the cups. Goblin started mass producing the machines which they named the Teasmade in the Thirties. They proved to be extremely popular and other brands such as Pye also began making the machines. By the late 60's over 300,000 units were sold every year. Sadly, they began to be regarded as old-fashioned and eccentric in the Eighties. They gained a reputation for 'naffishness'. However, who wouldn't want to be woken up by the sound of water boiling and a soothing cup of tea? (Some strange people prefer coffee in the mornings - this blog isn't for them. Just kidding!) Recently, the Teasmade has returned to fashion. The latest machine made by Swan includes an illuminated LCD clock, an alarm, and even a reading light! The alarm souns when the water has finished boiling. What do you do if you like milk in your tea? I don't think that that's been solved, unfortunately. You still have to put it in yourself! When spouse and I married 40 years ago, he promised that he would bring me a cup of tea and the weekend newspaper into bed, every saturday morning of our lives. Sofar so good, but I think the Teasmade sounds brilliant. How Do You Measure Wealth?